Two thousand years ago, the snowy peaks of the Carpathians provided shelter to ‘the bravest and most noble of the Thracians”, a fascinating population whose fundamental values were centered around courage and unwillingness to submit to anyone. You are invited to take a journey through the Orăștie Mountains along with the robot H.E.N.A. 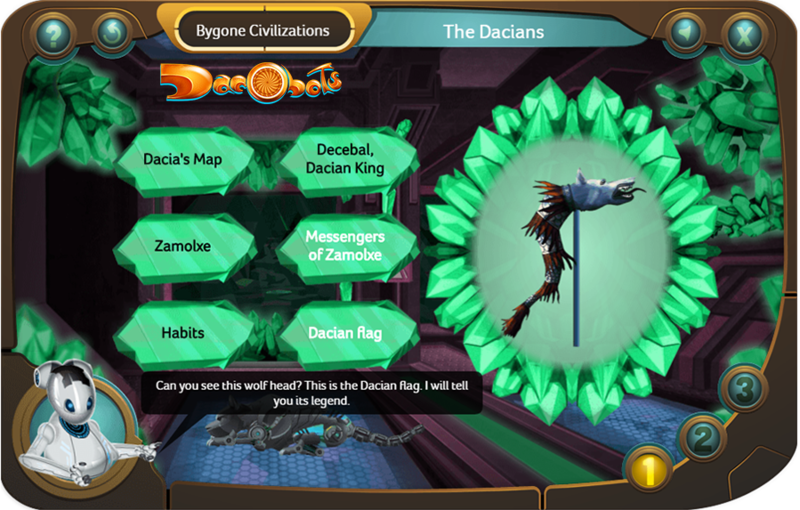 In this elearning game for kids she will introduce you to the mysteries of the Dacians and reveal the meaning of their traditions. 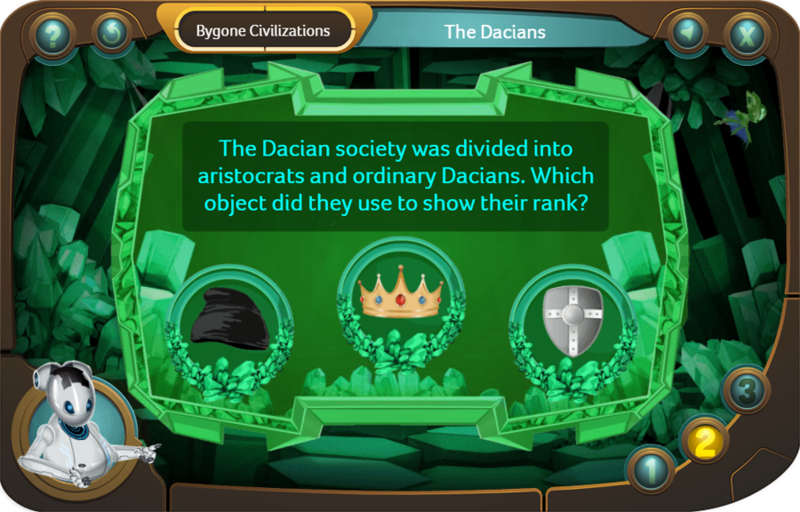 The three sections of the game have a double purpose – on the one hand, they are didactic, and on the other hand, they enable teachers to evaluate the knowledge of their students. 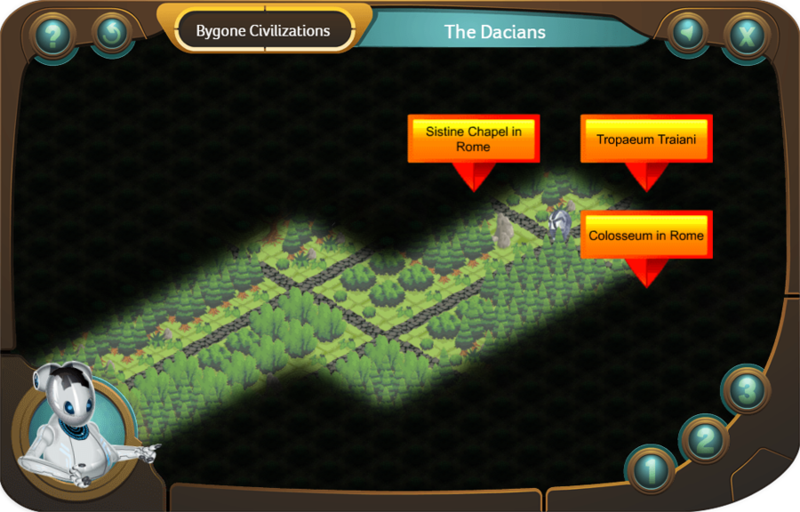 The first section is intended to familiarize children with the characteristics of the Dacian civilization. The information included in here is grouped in six different categories, each matching a certain topic. Children can learn about the territory inhabited by the Dacians, the ruler Decebal, the god Zamolxe and the messengers that were sent to him, the Dacian customs and the Dacian flag. The second section consists of a multiple choice test which combines evaluative and expository aspects with the purpose of turning information into reward by revealing new pieces of information when the user provides the right answer to a question. The answer options are depicted by images; visual stimuli ensure that information is effectively assimilated. The third section of this learning activity is intended to evaluate the knowledge that the app users have attained through a multiple choice test. The scenario is the journey of a robot to Sarmiegetusa Regia. As soon as the robot reaches a junction, the answer options appear on the screen. The robot takes the road that the right option was on. Using the technology of the present, children can gain a better understanding of the past in order to build a bright future! 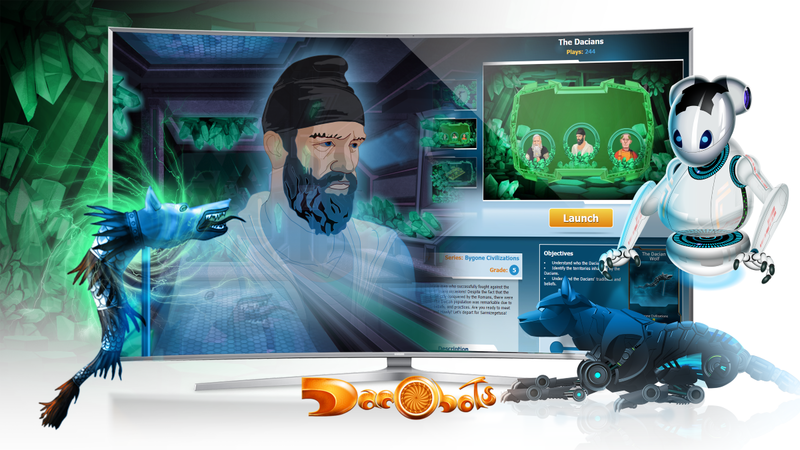 Explore further the "Bygone Civilizations" eLearning game series on the www.dacobots.com portal.